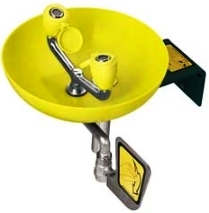 Speakman's SE-580 wall mounted emergency eyewash with plastic bowl is activated by a stainless steel push handle. It has a stay-open full flow ball valve. It also has a heavy duty wall mounting plate, twin spray heads with individual flow restrictors, and comes with flip-off dust covers. Ships Same Day if Ordered Before 12 Noon!